Localization of PfRH2a/b by immunofluorescence confocal microscopy. (A) 3D7 schizonts were dual labeled with anti-rPfRH240 mice sera and anti-clag3.1 rabbit sera. Mature schizonts immunolabeled with anti-rPfRH240 were stained with Alexa 488 linked anti-mouse IgG secondary antibody (green). Schizonts labeled with anti-clag3.1 rabbit sera were stained with Alexa 594 linked anti-rabbit IgG secondary antibody (red). (B) 3D7 mature schizonts were dual labeled with anti-rPfRH240 mouse sera and anti-EBA175 rabbit sera. Schizonts labeled with anti-EBA-175 antibodies were stained with Alexa 594 linked anti-rabbit IgG secondary antibody (red). 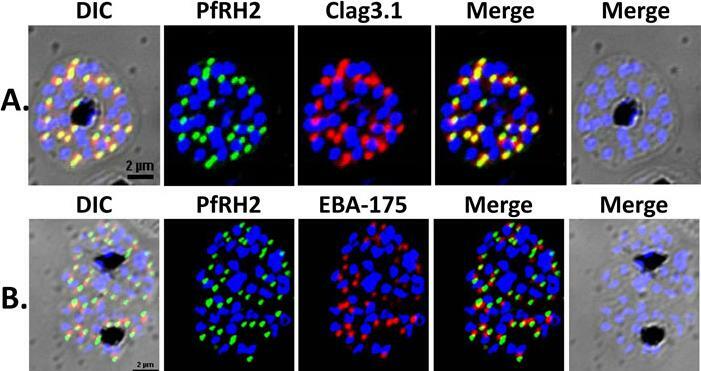 PfRH2a/b co-localizes with the known rhoptry bulb marker protein, clag3.1 demonstrating that it is localized in the rhoptries, and not with the microneme marker protein, EBA-175.Sahar T, Reddy KS, Bharadwaj M, Pandey AK, Singh S, Chitnis CE, Gaur D. Plasmodium falciparum reticulocyte binding-like homologue protein 2 (PfRH2) is a key adhesive molecule involved in erythrocyte invasion. PLoS One. 2011 6(2):e17102. Chimeric protein localization and processing. 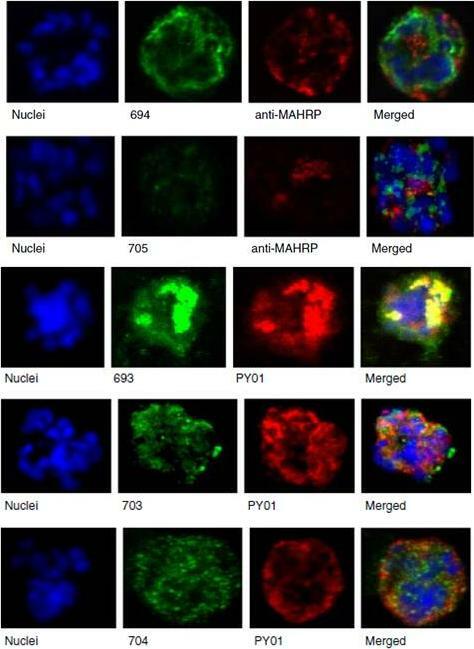 D10-AAA, D10-AAB, D10-ABB and D10-BBB schizonts were methanol-fixed and stained with rabbit anti-PfRh2a or rabbit anti-PfRh2b, mouse anti-PfRhopH3 and DAPI. Images were obtained using deconvolution microscopy. The chimeric proteins from both D10-AAA and D10-AAB localized to the apical organelles (Fig. 3A, left panel) and in close proximity to PfRhopH3 (middle panel). Fluorescence overlays showed some direct colocalization between the PfRh2a/b proteins and PfRhopH3 (right panel). 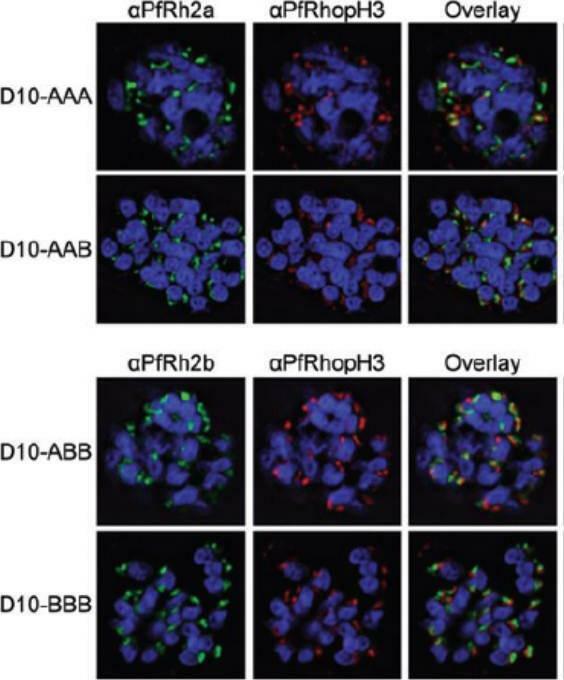 PfRh2a and PfRh2b are known to localize to the rhoptry neck whereas PfRhopH3 localizes to the rhoptry bulb.Dvorin JD, Bei AK, Coleman BI, Duraisingh MT. Functional diversification between two related Plasmodium falciparum merozoite invasion ligands is determined by changes in the cytoplasmic domain. Mol Microbiol. 2010 75:990-1006. Apical expression of RhopH1/Clag members -2, -3.1, and -9 in P. falciparum segmented schizonts. Schizont-infected erythrocytes were duallabeled with a-CL3.1B and a-RhopH2 mAb 61.3 in the 3D7 parasite line (Panel A); a-CL3.1A and a-CL9M (Panel B) and a-CL3.1A and a-CL2N (Clag2) (Panel C) in Dd2 parasite line. Overlaid images are shown in the right-hand panels. All segmented schizont-stage parasites are positive for the antisera against Clag2, -3.1, and -9. Nuclei are counterstained with either DAPI or Hoechst-33342 (Hx). Scale bar represents 5 mm. 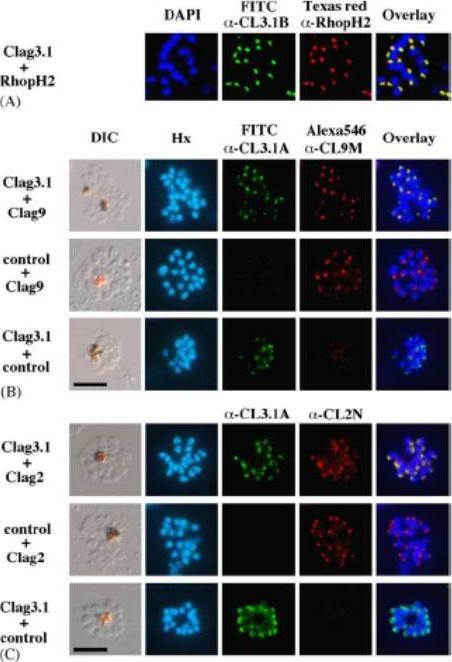 Overlaid images of the double-staining for anti-Clag3.1 and anti-PfRhopH2 or anti-Clag3.1 and anti-Clag9 sera reacting with segmented schizonts showed indistinguishable patterns of localization for these proteins. Clag3.1 and Clag2 are localized within the rhoptries of segmented schizonts. Kaneko O, Yim Lim BY, Iriko H, Ling IT, Otsuki H, Grainger M, Tsuboi T, Adams JH, Mattei D, Holder AA, Torii M. Apical expression of three RhopH1/Clag proteins as components of the Plasmodium falciparum RhopH complex. Mol Biochem Parasitol. 2005 143(1):20-8. Expression of rhoptry protein CLAG3.1 on surface of P. falciparum merozoites isolated in intracellular buffer (5 mM NaCl, 140 mM KCl, 1 mM EGTA), detected by IFA using anti-CLAG3.1 rabbit sera followed by FITC-conjugated (green) anti-rabbit IgG goat sera. Nuclear DNA was counterstained with DAPI (blue). Bright field, bright field merged with DAPI staining and merged fluorescence images (DAPI and FITC) are shown. Black bar indicates 2 mm.Singh S, Alam MM, Pal-Bhowmick I, Brzostowski JA, Chitnis CE. Distinct external signals trigger sequential release of apical organelles during erythrocyte invasion by malaria parasites. PLoS Pathog. 2010 Feb 5;6(2):e1000746. 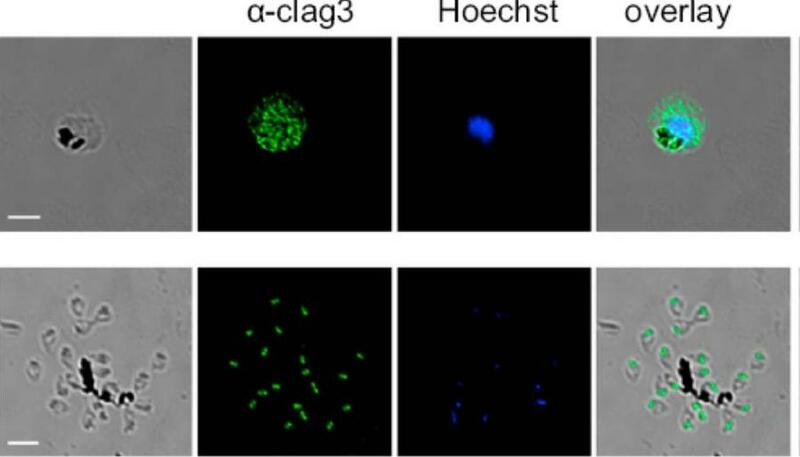 The anti-phospho-CLAG 3.1 antibody was used to determine the localization of phospho-CLAG 3.1 by immunocytochemistry of paraformaldehyde-fixed schizont stage parasites. Shown are two examples of schizont (segmenter) parasites stained with the phospho-CLAG 3.1 antibody. The samples were also stained with 4,6-diamidino-2-phenylindole (blue) to label the nuclei. The scale bar indicates 2 μM. The experiments shown are representative of at least three independent experiments. This antibody identified a punctuate localization of phospho-CLAG 3.1 consistent with rhoptry localization within merozoites of a mature schizont.Solyakov L, Halbert J, Alam MM, Semblat JP, Dorin-Semblat D, Reininger L, Bottrill AR, Mistry S, Abdi A, Fennell C, Holland Z, Demarta C, Bouza Y, Sicard A, Nivez MP, Eschenlauer S, Lama T, Thomas DC, Sharma P, Agarwal S, Kern S, Pradel G, Graciotti M, Tobin AB, Doerig C. Global kinomic and phospho-proteomic analyses of the human malaria parasite Plasmodium falciparum. Nat Commun. 2011 2:565. Ppolyclonal antibodies to a carboxy-terminal recombinant fragment conserved between the two clag3 products were prepared. Confocal microscopy with this antibody confirmed reports localizing these proteins to the host cytosol and possibly the erythrocyte membrane as well as within rhoptries of invasive merozoites.Nguitragool W, Bokhari AA, Pillai AD, Rayavara K, Sharma P, Turpin B, Aravind L, Desai SA. Malaria parasite clag3 genes determine channel-mediated nutrient uptake by infected red blood cells. Cell. 2011 145:665-77. Immunofluorescence and immunoelectron microscopy on late asexual blood stages. Reaction of mAb 84 RhopH3 with (A) air-dried or (B) aceton fixed FCCE1-Niger Plasmodium flaciparum parasites or (C) air-dried P. chabaudi parasites. (D) reaction of mAb 47 with FCCE1-Niger P. falciparum parasites: reaction with mAb 109 with air-dried FCCE1-Niger P. falciparum parasites or (F) P. vivax parasites. (G) Immuno-electron microscopy using mAb 91 RhopH3. RhopH3 localized to the rhoptries.Doury JC, Bonnefoy S, Roger N, Dubremetz JF, Mercereau-Puijalon O. Analysis of the high molecular weight rhoptry complex of Plasmodium falciparum using monoclonal antibodies. Parasitology. 1994 108:269-80. Cambridge University Press © 2009. Left row: mAb 1B9 Immunofluorescence of merozoite invasion. Thin smears were incubated with mAb IB9, FITC-goat anti-mouse IgG and counterstained with ethidium bromide. (A and C) to identify parasite nucleus. (A) Merozoites attached to erythrocytes. Erythrocyte at upper right has been invaded by two merozoites. 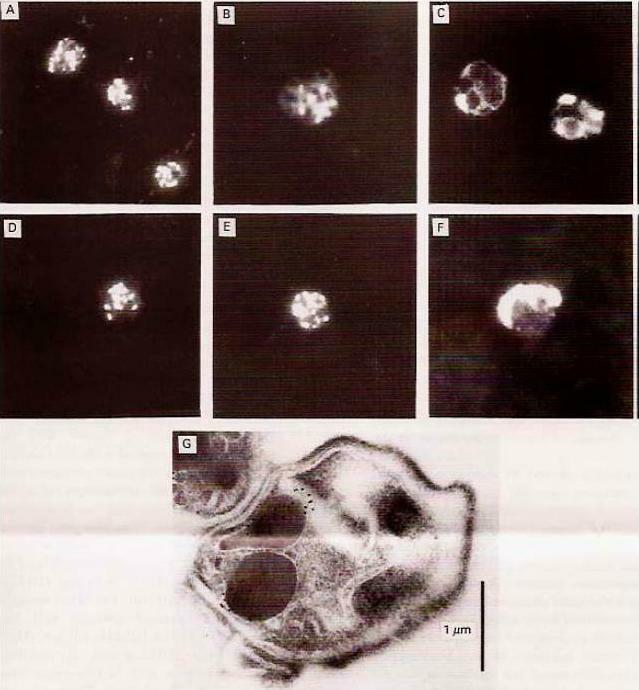 (B) Merozoites in the process of invading; rhoptry protein is discharged around erythrocyte surface. (C) Erythrocytes invaded by merozoites. Rhoptry protein is localized in infected erythrocyte membrane.Right picture: Immunoelectron microscopic localization of the rhoptry protein using mAb 1B9 and protein A-gold. (A) post-embedded immunolabeling of mature schizont-infected erythrocyte showing localization of 5-nm gold particles over rhoptries. EM, Erythrocyte membrane; SM, schizont membrane; FM, free merozoite; R, rhoptries. 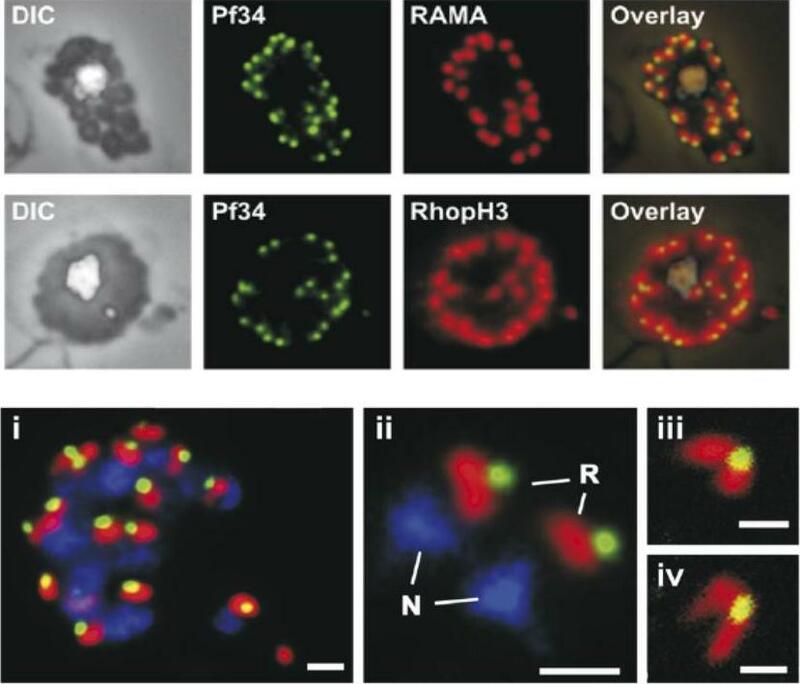 (Inset) High magnification of paired rhoptry organelles showing localizaltion of rhoptry antigen.Sam-Yellowe TY, Shio H, Perkins ME. Secretion of Plasmodium falciparum rhoptry protein into the plasma membrane of host erythrocytes. J Cell Biol. 1988 1061507-13. Right panel:Immunodetection of P. falciparum proteins by immuno-electron microscopy, using mAB SP1AG5. Stage-specific-infected erythrocytes were processed as described. Schizont-infected erythrocytes were reactive with antibody as shown. Gold particles (15 nm) in panel label longitudinal clefts (Maurer’s clefts, C); and panel B. They label knobs (K):Stage-specific IFA using mAbs. A. mAb with fluoresceinLeft panelisothiocyanate-conjugated staining. B. mAb co-localize with Bodipy ceramide in trophozoites and schizonts (C). 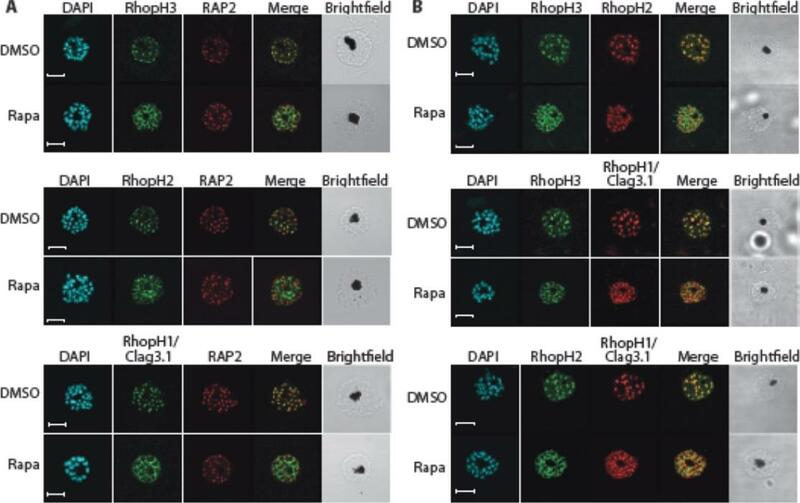 This suggests that Rhop3 localize in lipid-rich areas of the parasite, putatively within the intra-host cell cellular network.Sam-Yellowe TY, Fujioka H, Aikawa M, Hall T, Drazba JA. A Plasmodium falciparum protein located in Maurer's clefts underneath knobs and protein localization in association with Rhop-3 and SERA in the intracellular network of infected erythrocytes. Parasitol Res. 2001 87:173-85. With kind permission of Springer Science+Business Media. 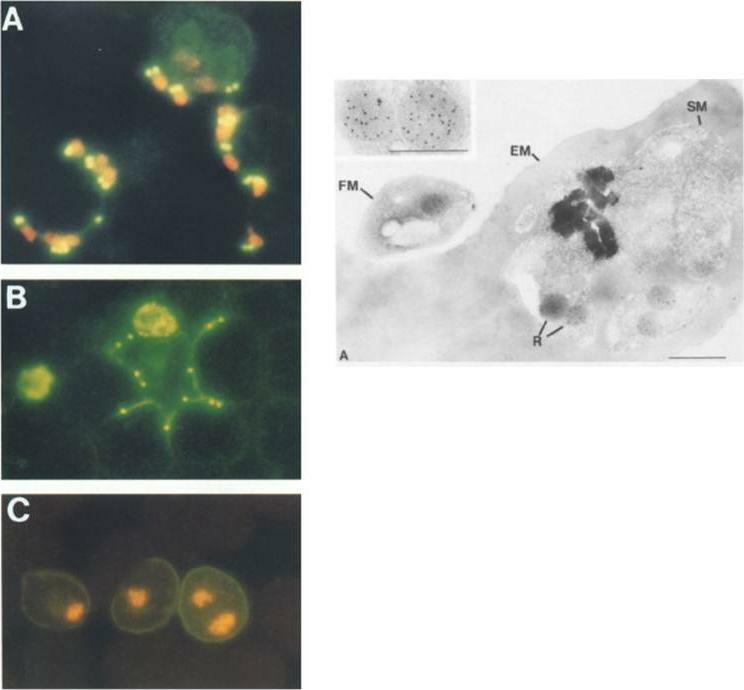 Subcellular localization of PfPLP1 in schizonts and merozoites of P. falciparum. (a) Co-immunostaining of PfPLP1 (green) with merozoite surface protein MSP1 (red). (b) Co-immunostaining of PfPLP1 (green) with micronemal protein EBA-175 (red). PfPLP1 colocalizes with EBA-175 (colocalization coefficient being more than 0.75). (c) Co-immunostaining of PfPLP1 (green) with rhoptry protein CLAG3.1 (red). PfPLP1 is not localized in rhoptry. Nuclei were counterstained with DAPI and Scale bar, 2 mm. (d) Immunoelectron microscopy of PfPLP1. Ultrathin sections of merozoites and late-stage schizonts were labelled with anti-PfPLP1 mouse sera followed by gold-labelled (15 nm) anti-mouse IgG secondary antibodies. 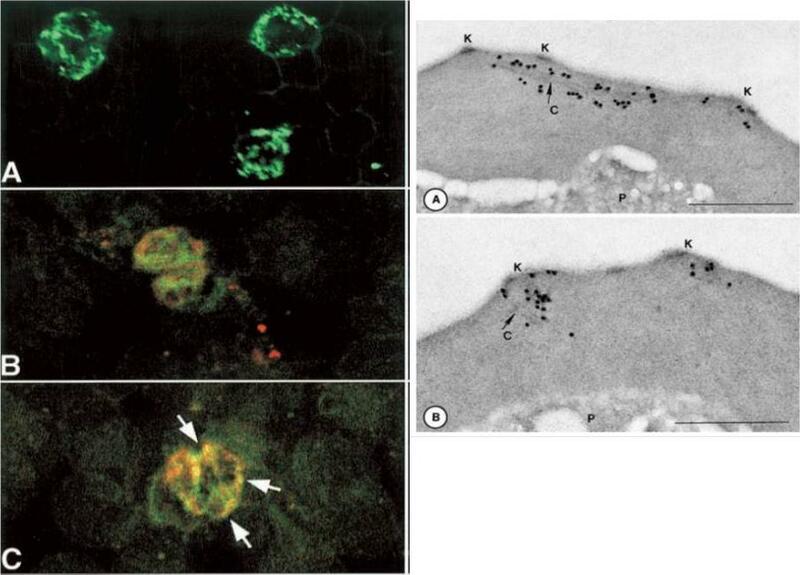 Gold particles were detected in elongated, membrane-enclosed micronemes towards the apical end in schizonts and merozoites. Scale bar, 500 nm. 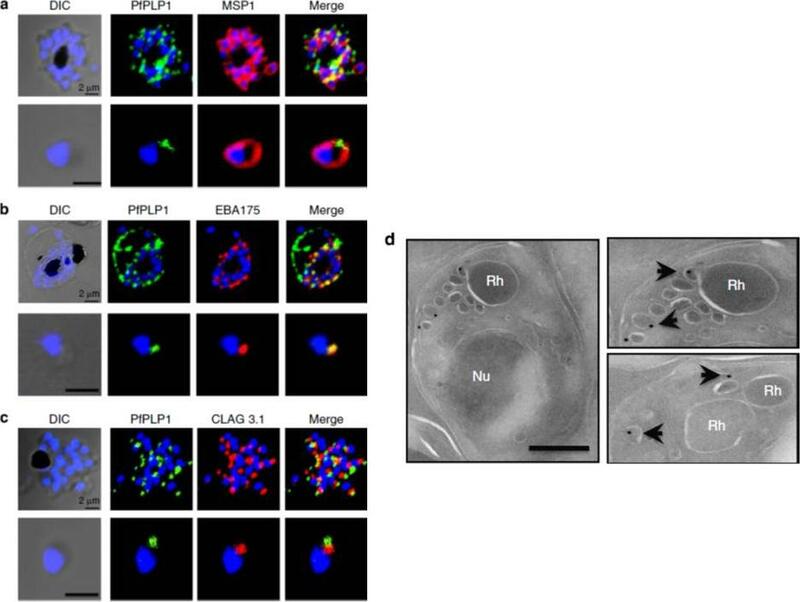 PfPLP1 is localized to the micronemes of merozoites.Garg S, Agarwal S, Kumar S, Shams Yazdani S, Chitnis CE, Singh S. Calcium-dependent permeabilization of erythrocytes by a perforin-like protein during egress of malaria parasites. Nat Commun. 2013 Apr 16;4:1736. Pfμ1 co-localizeswith rhoptrymarker proteins in schizont stage parasites. 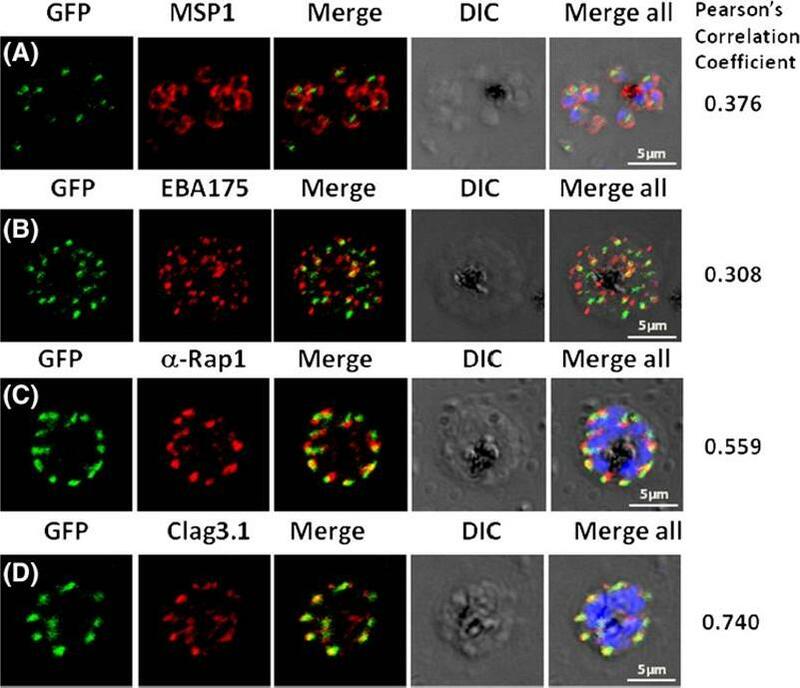 Transgenic parasites expressing Pfμ1–GFPwere immunostained with antibodies specific to the Merozoite surface localized MSP1 (A), Microneme localized EBA175 (B), and Rhoptry localized RAP1 (C) and Clag3.1 (D). The parasite nuclei were stained with DAPI and slides were visualized by confocal microscopy. Representative images are shown for each antibody, together with DIC images; scale bars denote 5 μM. To quantify co-localisation, Pearson correlation coefficients of the individual stains were calculated and are shown in the right panel of each image. IFA with antibodies to rhoptry (RAP1 and Clag3.1), microneme (EBA175), and surface markers (MSP1). IFAwith anti-MSP1 antibody showed no overlap in staining betweenMSP1 and Pfμ1 (A). Similar results were seen with antibodies to EBA175 (B). Importantly, anti-RAP1 and anti-Clag3.1 showed co-localization with the Pfμ1–GFP chimeric protein (C and D), suggesting a potential role for Pfμ1 in rhoptry trafficking. Co-localization between Pfμ1 and RAP1 was first observed ~24 h post invasion in budding vesicles near the Golgi. 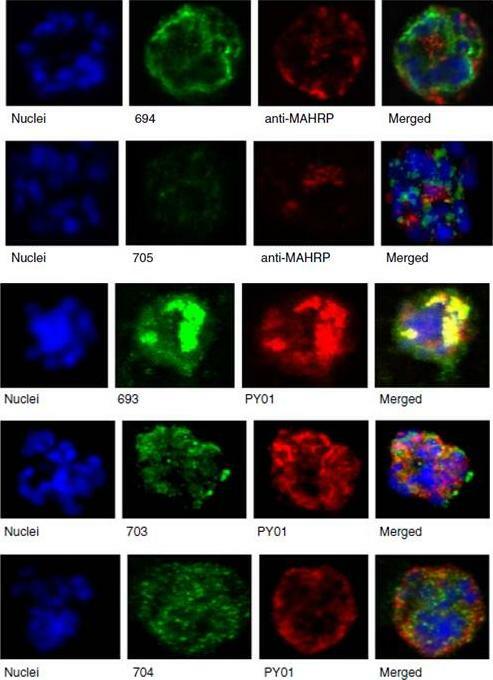 As nuclear division commenced (32 h), Golgi multiplication occurred as well, and this resulted in apical distribution of Pfμ1 along with RAP1 in the rhoptries. Kaderi Kibria KM, Rawat K, Klinger CM, Datta G, Panchal M, Singh S, Iyer GR, Kaur I, Sharma V, Dacks JB, Mohmmed A, Malhotra P. A role for adaptor protein complex 1 in protein targeting to rhoptry organelles in Plasmodium falciparum. Biochim Biophys Acta. 2015 1853(3):699-710. Truncation of RhopH3 leads to mistrafficking of components of the RhopH complex. IFA of mature schizonts of control (DMSO) and rapamycin-treated rhopH3-loxP parasites, probed with MSP1-specific antibodies (either mAb 89.1 or rabbit polyclonal anti-MSP1 antibodies; red) and antibodies to the three indicated RhopH components (green). 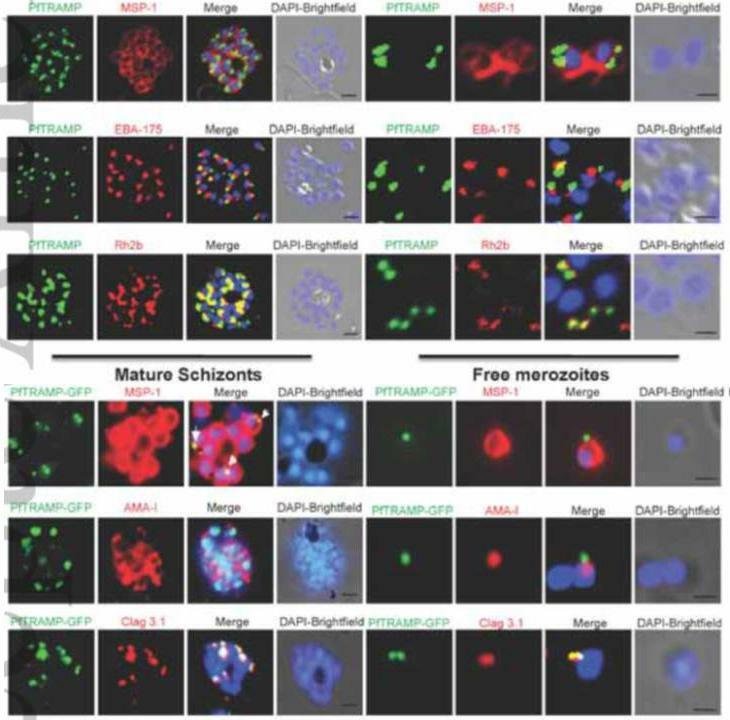 Mis-localisation of the RhopH proteins was observed in all cases, and in the case of RhopH3 the protein often appeared to reside external to the plasma membrane of intracellular merozoites. Parasite nuclei were visualized by staining with DAPI. Note that, for clarity, the merge panels do not include the DAPI signal. Scale bar, 5 μm.Sherling ES, Knuepfer E, Brzostowski JA, Miller LH, Blackman MJ, van Ooij C. The Plasmodium falciparum rhoptry protein RhopH3 plays essential roles in host cell invasion and nutrient uptake. Elife. 2017 6. pii: e23239. Truncation of RhopH3 leads to mistrafficking of components of the RhopH complex and loss of complex formation. A) IFA showing colocalization of RhopH3, RhopH2 and RhopH1/Clag3.1 with the rhoptry marker RAP2 in schizonts of control (DMSO) rhopH3-loxP parasites but loss of colocalization following rapamycin (Rapa) treatment. Parasite nuclei were visualized by staining with 4,6-diamidino-2-phenylindole (DAPI). Scale bar, 5 μm. Immunofluorescence analysis (IFA) showed that, as expected, RhopH3 colocalized with the rhoptry marker RAP2 in mature schizonts of control rhopH3-loxP parasites. However, in rapamycin-treated (RhopH3Δ4-219 6) parasites, this colocalization was lost, although RAP2 was still detected in a punctate, apically-disposed pattern typical of rhoptries B) Colocalization of the members of the RhopH complex. 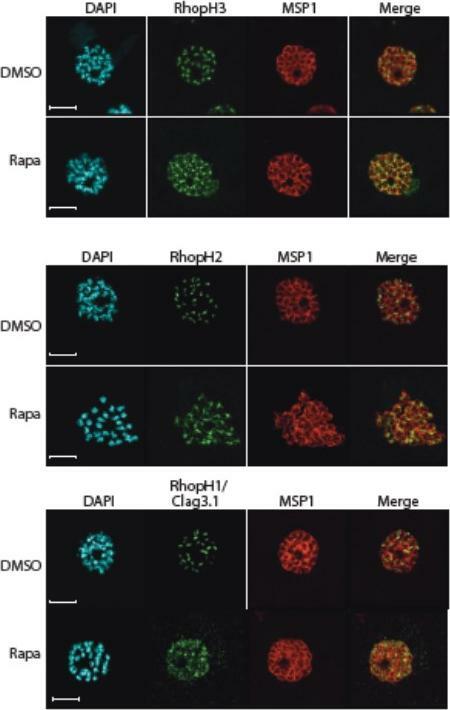 RhopH3, RhopH2 and Rhop 1/Clag3.1 colocalize in rhopH3-loxP parasites treated with DMSO, but this colocalization is lost in parasites treated with rapamycin. Scale bar, 2 μm. 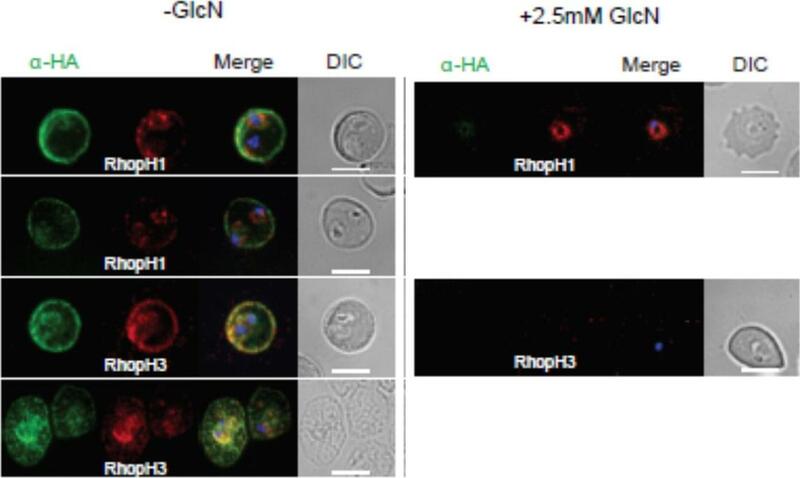 Neither RhopH2 nor RhopH1/Clag3.1 colocalized with 233 RhopH3Δ4-6 in the mutant parasites. The RhopH2 and RhopH1/Clag3.1 signals were also distinct in the mutant parasites, although in this case some limited colocalization of these proteins was apparent (bottom images).Sherling ES, Knuepfer E, Brzostowski JA, Miller LH, Blackman MJ, van Ooij C. The Plasmodium falciparum rhoptry protein RhopH3 plays essential roles in host cell invasion and nutrient uptake. Elife. 2017 6. pii: e23239.